Ivana Sajko was born in 1975 in Zagreb, Croatia. After receiving a bachelor’s degree in dramaturgy from the Academy of Dramatic Arts at Zagreb University, she earned a master’s degree in literature from the university’s philosophy department. In 1998, her debut titled »Naranča u oblacima« (tr: Orange in the clouds) won Croatia’s state prize for dramatic texts, an award she has earned several times since. In 2004 and 2005 Sajko also received the Croatian theater prize. From 2000 to 2005 she and her performance troupe Bad Company explored the dramaturgy of dance, after which she again dedicated herself to writing theater plays and prose. She described in an interview how her experiences with physical expression also influenced her literary work: it is important to her that »those who read my texts feel a physical sensation, as they would through dance«. Furthermore, the performer should not yield to the text, but rather interact with it, exposing it on stage, as she did herself in »Bombenfrau« (2008; Eng. »Woman Bomb«), a piece about the last 12 minutes and 36 seconds of a suicide bomber’s life. During this performance she calls for the audience to count down the seconds remaining in the play, and presumably of the protagonist’s life. In »Europa« and »Archetyp: Medea«, which along with »Bombenfrau« were published by Verlag der Autoren in a 2008 anthology, the author also offers unfiltered access to a female figure’s stream of thoughts. Here, form is more important than content – that is, the »how« of her writing prevails over the »what« – thereby highlighting the border between the fictional and real worlds. It is only fitting that her first prizewinning novel, which focuses on the process of creation, is titled »Rio Bar« (2011), written in a bar with this name. In »acht Monologen für acht Schauspielerinnen in weißen Hochzeitskleidern« (tr: Eight monologues for eight actresses in white wedding dresses), the impossibility of understanding the phenomenon of war from only one perspective is addressed through a polyphony of voices sharing experiences of violence and powerlessness, which again travel through the body and can only be understood upon being felt. Correspondingly, references to actual events of the Balkan conflict remain only footnotes. 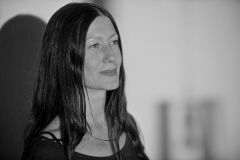 In 2015 Sajko not only wrote her book »Ljubavni roman« (tr: Romance novel), but also published, in German, the essay titled »Auf dem Weg zum Wahnsinn (und zur Revolution)« (tr: On the road to madness (and to revolution), a manifesto of her understanding of literature as art that not only maintains contact to reality, but also demands that the reader do the same. Actions will follow the shock experienced while reading, for »a thought is only real if it diverts us from expected directions and leads us to somewhere we have never been«. Ivana Sajko lives in Zagreb und Istria.